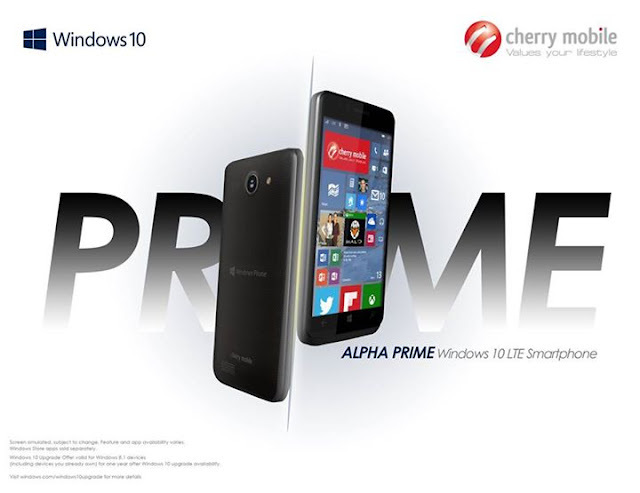 Cherry Mobile Alpha Prime Windows 10 smartphone with LTE connectivity becomes official as the company took the Computex 2015 stage to announce the handset. Cherry Mobile Alpha Prime smartphone becomes official as the company took the Computex 2015 stage to announce the handset. The Alpha Prime is not just an ordinary Windows Phone, it actually is Windows 10 ready! In the anticipation of the worldwide release of the Windows 10 platform on July 29, Filipino smartphone enthusiasts could have the chance to experience the new version of the popular OS with the Cherry Mobile Alpha Prime. The local company spilled a little beans regarding the device’s specification sheet. All that we are having so far is the fact that the device will be an LTE smartphone. Thus, we could expect the Cherry Mobile Prime to pack, at least, a Snapdragon 400 – the same chipset that we can find in the Cherry Mobile Ultra. Aside from the connectivity, the company is still tight-lipped about the Cherry Mobile Alpha Prime. The company have released several smartphones in Alpha series since it struck a partnership with Microsoft last year; the Alpha Style, Alpha Luxe and Alpha Neon are the most popular Windows Phones off the series. Update: It seems like the Cherry Mobile Prime will be powered by a Snapdragon 210. It comes with two variants with 4-inch and 5-inch display with 512MB/1GB of RAM, 4GB/8GB internal memory, and 5MP/8MP rear camera. The bigger handset is powered by 1500 mAh battery. Cherry Mobile also confirmed that the device will have a dual-SIM capability.